Hungry for a meaty meal? Order mouth-watering steak, chicken and seafood dishes, ribs, burgers and wraps from a Hog’s restaurant near you. Get Hog's Australia's Steakhouse delivered*. Get Hog's delivered to your door! If you have eaten at Hog’s Australia’s Steakhouse, you’d know that they take their ‘Hog’spitality’ very seriously, but always while having fun! The same can be said when they’re preparing your delivery! Each meal is freshly made by expert grill masters using fresh, quality produce sourced locally from Aussie growers. Using beef selected especially for Hog’s Australia’s Steakhouse from cattle raised on open pastures, you can be guaranteed an exceptional meal. Enjoy a mouth-watering steak, as well as chicken and seafood dishes, ribs, burgers, wraps, salads, pasta and of course curly fries. There’s even kids meals to choose from. Calling all carnivores! If you’re craving a tender, mouth-watering steak, but have no time to cook, simply order through Menulog and have your favourite Hog’s menu item delivered to your door. 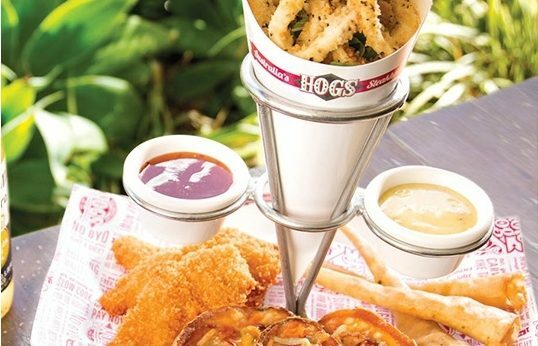 From burgers, wraps, and salads, Hog’s Australia's Steakhouse can feed your whole family easily. Enjoy your meal in your home, any time of day in just a few taps on the Menulog app or through your desktop.